It seems that everywhere you look today, someone is preaching about how to “eat healthy” and the best ways to lose fat. It can get confusing and overwhelming and often we are left not knowing who to trust or what to do. 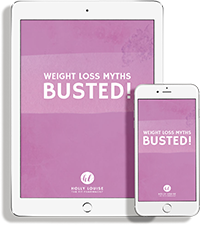 Here are some of the ridiculous myths that you MUST know about. If you have been given this advice, please educate yourself! You could be giving up your favourite foods or doing ineffective training for no reason! Myth #1: Calories don’t matter. Um…yes they do. Calories are the driving factor for weight management. Consuming less calories than you burn will result in weight loss. Eating more calories than you burn will equal weight gain. Sure, your body will function better when you fuel it with calories from micronutrient-dense foods but the law of thermodynamics proves it doesn’t matter where these calories come from. Myth #2: You can spot reduce fat. I have a lot of people say to me “I just want to lose this tummy fat” or “how can I tone my bum and thighs?” The concept of targeted fat loss or spot reduction follows the false belief that training a specific muscle or muscle group will result in fat loss in that area of the body. There really is no better way to explain why spot reduction is a myth than by telling you that the only thing exercises actually target is muscles, not the fat that is covering those muscles. So then how do you lose that fat from the specific spot you want to lose it from? Simple. You create a caloric deficit through either a proper diet, exercise, or ideally a combination of both. So, for everyone doing one million crunches everyday thinking it’s having any direct effect whatsoever on the fat on your stomach, you are wasting your time! The fat covering them will remain completely unchanged. Myth #3: You must avoid gluten. Eating gluten free is not necessarily healthier if you do not suffer from Coeliac disease or have a gluten intolerance/sensitivity. If gluten-containing products don’t cause you any digestive issues or make you feel crappy, then avoiding them isn’t going to make you any “healthier” or lose fat faster. Many gluten-free breads and baked goods still use nutrient-poor, refined flours and are often high in sugar. If you think you might be sensitive to gluten, or have any of the symptoms of Coeliac disease, it is best to talk to your doctor. Myth #4: Dairy is a fat loss killer. Dairy foods often get a bad rap because they can be high in calories, saturated fat and cholesterol – things that have been associated with increased risk of heart disease, high cholesterol levels, inflammation, diabetes and other health issues. However, research shows that including three to four serves of dairy in a reduced calorie diet can actually help accelerate weight and fat loss. This is likely due to the fact that calcium can reduce the amount of dietary fat absorbed by the body. Studies also suggest dairy may reduce feelings of hunger – preventing snacking. Again, unless you have an allergy or intolerance to lactose there is no need to avoid it! Myth #5: Natural sugar is different from refined sugar. Sugar is sugar – no matter where it comes from. Whether it’s in a piece of fruit, can of Coke or a pastry, sugar is made up of the same two components: fructose and glucose. The molecular structure and composition of sugar molecules is the same no matter where they come from. The difference is the other benefits we get from the foods that contain sugar. Fruit offers good stuff like vitamins, antioxidants and water, while processed food like lollies and desserts are often nutritionally void. Fruit also tends to have a lot of fibre, which actually slows down your body’s digestion of glucose, meaning your body has more time to use up glucose as fuel before storing it as fat. But if you drink fruit juice, consume maple syrup or honey, your body responds the same way as if you drank a soft drink. Myth #6: You must eat organic. Just because something is organic, doesn’t mean it is automatically good for you! Eating organic cookies, crackers, chips, and lollies have the same amount of sugar, fat, and empty calories as non-organic versions and eating them in excess can still contribute to weight gain. Most people buy organically-grown food products because they are concerned about pesticides, additives, antibiotics or other chemical residues. Although pesticide residues in fruit and vegetables are monitored in Australia, many people believe organic food is healthier. Interestingly, several studies have compared the nutritional content of organic and conventionally grown plants, and most have shown no significant differences in key vitamin and mineral content. Myth #7: Low-fat versions are better than full-fat. If you think eating fat will make you fat – think again! You need fat in your diet. Fat is not bad – not having enough fat is! Again, this goes back to our calories in vs calories out point. Any extra calories you eat that your body doesn’t use can be converted into body fat, not just dietary fat. Fat is more calorie dense, which means you need to be aware of your portion sizes. This can also be good though, because it helps you feel fuller for longer. Low-fat products can be lower in calories but are often super high in sugar or salt – which don’t really make you feel full and can result in overeating. Make sure you read the nutrition panel before choosing the low-fat version! Often, you are better off eating a small serving of the full-fat kind so you actually enjoy it and feel fuller for longer. If you are ready to reach your body composition goals using the most effective and SUSTAINABLE method that is backed by research and evidence then contact me today and let’s get started!